In Spring of 2016 Urban Blooms gave an in office presentation to GBBN Architects in downtown Cincinnati. This was one of our first presentations to a large architecture firm, in total we have given over 30 presentations to firms across the Midwest. GBBN has since been a great partner and we have worked together on multiple projects, bringing the beauty of nature into working spaces. The first of which was Tri-Health’s new 7-story office complex in Cincinnati’s Baldwin tower. An opportunity to brighten the day of the hundreds of healthcare workers. This project features 5 living walls, each 8 feet tall by 10 feet wide. These walls are located on the 7th, 9th, and 11th floors, with over 70 feet of elevation difference between the highest and lowest gardens. The gardens are to be set back into each wall by 6 inches and receive a very low amount of natural light. The challenge of this project was to evenly feed each of these gardens across such a tall elevation difference and provide them with optimal light that makes for happy plants and a present working environment. This project ended up transforming Tri-Health’s new offices into a model of biophillic design; creating one of the most extensive living office projects in the entire country. In total, this project features over 1000 vibrant tropical plants from 20 different species, painted across 5 living walls on three separate floors. 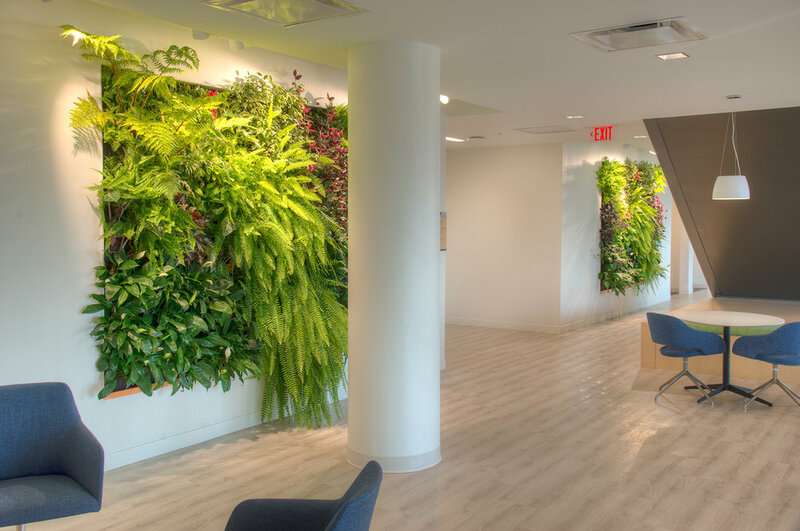 Urban Blooms designed a central irrigation network that delivers pressure regulated water and nutrients directly to each living wall. This system along with full spectrum LED lighting fixtures keeps the plants in optimal growing condition.